When a creative passion takes hold and you realise you have found your true calling, you must act and that is what Bree Woolliscroft has done. Within the past year, Bree has made the leap to leave her career in Landscape Architecture to pursue her passion for wedding and elopement photography. Bree says that she's come to understand herself and her surroundings better by looking at the transformation of moments into memories thanks to a camera. I'm absolutely delighted to welcome Colorado based destination wedding photographer Bree Woolliscroft to the Bridechilla Directory! Tell us about how you got started in the wedding business and what you love most about working in weddings! I've been in the photography world for about 10 years, back when I was fifteen I would spend my hot and sticky summers in South Florida running barefoot through the neighbors yards down to the lake to take self portraiture to tell a story. I followed through with photography through high school and in to College where I got my BFA. After college however, I was on my own and needed a career that would pay the bills. I fell in to Landscape Architecture, packed up my little Toyota and moved out to Denver and even began a masters degree. But it wasn't 'right'. I was getting the grades, excelling, but something was missing and I ended up fighting a hard battle with depression and anxiety. Ultimately, that led me to turn back to my camera for creative relief when I realized that photography was exactly where I needed to be. I often refer to myself as a wedding photojournalist - I think that really resonates with my brand and the thing I love most about capturing wedding days: The honesty. My heart was in storytelling, and I suspect it always has been. There's nothing that gives me joy as much as capturing the biggest day of my clients lives - I mean that. I hit the ground running with destination wedding and adventure elopement photography, quit my 9-5 in January and being full-time wedding photographer has meant that I get to wake up every day the happiest I've ever been. I refuse to be some impersonal vendor stepping in to stage a couples day for a feature blog, or for Dirty Boots and Messy Hair. Instead, I always go in to it as a witness - I believe wholeheartedly in capturing your love for exactly how it happened: all candidness, tears, laughs, and emotions. The REALNESS of the day and the empire love story you've built leading up to the day - that's what makes it worth it. Jokingly, I often refer to myself as a wedding photojournalist - I think that really resonates with my brand and the thing I love most about capturing wedding days: The honesty. I'll never refer to myself as a 'wedding vendor' because it's way more important to me that my couples feel a deep connection and relationship with me - they trust me. ​I love the real bride and groom. The ones who aren't afraid of getting a little dirty, of crying their makeup off, who isn't afraid of the emotions they're going to feel on that day. My couples understand that we are friends FIRST. They understand I'll never refer to myself as a 'wedding vendor' because it's way more important to me that my couples feel a deep connection and relationship with me - they trust me. And the photographs of their day are the most important thing to them because they know that when all is said and done, that's all they are left with to pass down and to hang on their walls. They know that these images are what they'll have to remember where they started - in good times and in bad. That those close to them will look at them ten years down the road, and say "wow, they still love each other THAT much.". Even when marriage gets hard -the first thing they know they will reach for are their wedding images. My brides value their story and the heirlooms we're going to create together. Trends are going to fade, but knowing that I've taken the time and effort to build a friendship with my couples first so that they will allow me to capture their day in truth, THAT makes me feel like I'm doing something right. What do you feel makes you unique and different from other wedding pros? I believe to my core that as a wedding photographer or wedding professional of any kind, the day is not about us. It is not about 'getting the shot', it is not about staging something that is going to be blog-worthy or take time out of the biggest day of their lives to create portfolio work- Instead, I believe deeply in being a witness. They built a love that got them to the top of the aisle, and they have a story worth telling. I really believe that by not telling that story exactly how it happened, I wouldn't be doing the work they've put in to their relationship justice. It's just not about the publications for me, nor is it about the 'instagram worthy' image. Trends are going to fade, but knowing that I've taken the time and effort to build a friendship with my couples first so that they will allow me to capture their day in truth, THAT makes me feel like I'm doing something right. What is your favorite wedding related memory? It's kind of a funny story but my husband is from the UK and I'm from the US, and we got engaged October 1st 2016, and married with 65 people in attendance from all over the world on October 22, 2016. Yes - 22 days later I pulled off an international wedding. We were just two kids who had no business planning a wedding - knew nothing about how to do it but our love was bigger, we were really crazy about each other and there was never a doubt in our mind so we cared about very little during the planning process. It was so meaningful for us to have our friends and family there from all over the US and UK, but I think the most meaningful thing of all was finally seeing my husband at the top of the aisle - crying. That was the first time I'd ever seen him cry and I just about lost it. Everything else fell away, and none of the decor, meals, or outfits mattered. It was just me and him. I realize it now, it really was always just me and him. What is one thing you wish more couples knew about wedding planning as a whole or your specific role in the wedding? As far as the planning process - I'm very hands on and believe that we should be! I want to help you with whatever you need. Don't feel like once the contract is signed and the deposit is paid that I don't want to be involved - text me all the details, send me pictures of your dress! I love feeling like you're excited for me to be a part of your day - because I'm INCREDIBLY honored you chose me!! Share 3 fun facts about you and/or your business! I shoot ALL OVER the USA and am working on building myself a place in the international market! WOOHOO DESTINATIONS! I can't say no to wedding cake --- ever. I'll probably lose it and start blubbering during your daddy daughter dance, I do every single time. How do you help your clients "keep their chill" during the wedding planning process? ​I'm there every step of the way. Need a step-in planner for an elopement? I'm there. Need someone to go scout locations? I'm your girl. Do research on portrait locations for your destination wedding? I have you! I remind all of the brides that when it comes down to it - the only thing that will ultimately matter in getting married is your love story, your promises and your marriage certificate. You don't need anything else really - and if you WANT more, do what is feasible and comfortable and reflects YOUR personality. I'm going to treat my brides as if I'm another bridesmaid because I deeply believe they don't need another person to worry about on their big day - they need someone who will be worried about THEM. 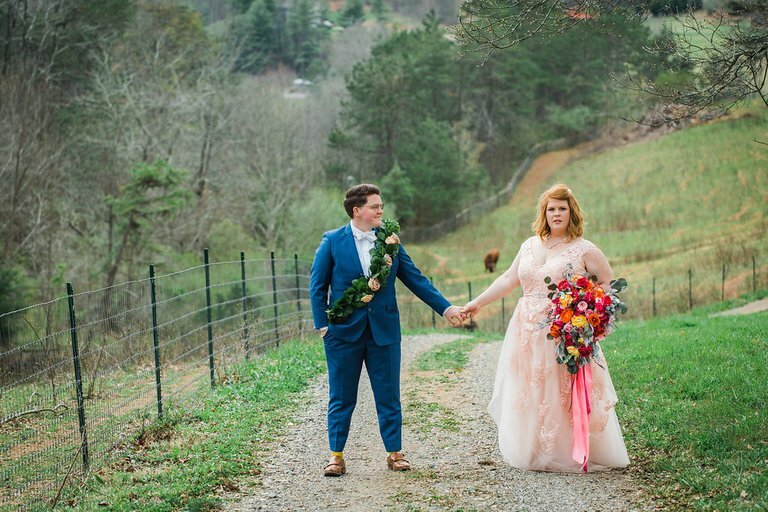 A lot of my couples opt for an elopement where we can craft their day to be an experience - and this often is SO relieving for them. Whether that's getting up at 2 AM to hike to a summit where you change in to your dress or suit, or spending the day skiing or rock climbing, or just exploring a new city in your best dressed - adventure elopements are ALWAYS an option! Also, I make sure that my bride and groom get quiet time just for them, especially if they're having a traditional wedding. Whether that’s sharing a plate of chicken wings tucked away on the staircase with a beer in secret after the ceremony, or a quiet few moments alone for your first dance in a beautiful and remote location - the entire day is about you and I think it's easy to forget that amongst the noise of planning a wedding. Take time for you. I have my brides and grooms make a playlist of their favorite songs to listen to during our portraits, we treat it like a mini-date. Just you two and all the feels. Want to work with Bree? Connect with Bree via her website and be sure to check out her Bridechilla Directory listing. Bree is also a member of the Bridechilla Community, so you can connect with her there too! Generation Tux- The right look. The right fit. The right choice for your wedding. Groomchillas, it's your time to shine! Grooms and groomsmen attire shouldn't be an afterthought or something that is decided in a 30 minute whirlwind visit to a rental store, where they're kitted up with a boxy suit that's been worn by hundreds of other dudes (which also didn't fit them either). It's time to ditch the stereotype of men not taking an active interest in what they're wearing to their own wedding because we know that's just another wedding myth and boy do we love slaying stereotypes at Bridechilla! It is always an absolute pleasure to welcome new Bridechilla Directory members into our directory family. We are delighted to feature a Groomchilla-centric company, Generation Tux, who offer super stylish suits and tuxedos delivered straight to your door. With free home try-﻿on and with thousands of color combinations and 21 suit and tux styles, you're guaranteed to find what you need AND look freaking amazing. Well, we started this company to make it easier on couples to order their suits or tuxedos AND situate their groomsmen. Guys are lazy. And stores are terrible. We take care of both! We take care of everything. Free swatches, Free home try-on and a free suit or tux for the groom. Mix that with our service team that wrangles all the groomsmen and you get all the chill. How do you ensure that you will get the ‘right fit’ with an online rental? They say a guarantee is only as good as the person that stands behind it. George Zimmer, our founder and CEO, has been dressing grooms for 40 years. He has had the honor of playing a role in millions of weddings and is now revolutionizing the entire wedding rental experience. What’s the difference between Generation Tux and other suit rental businesses? “Looking good has never been this easy", means something to us. It means you will look and feel great in our suits and tuxedos. It means you can lose the measuring tape. It means you will be dressed in the finest fabrics in the rental industry. And most importantly, it means you can relax and enjoy your wedding. We understand this is a rental suit or tuxedo for one of the most important days of your life. That is why Generation Tux will ALWAYS innovate to ensure you are receiving the best possible quality and service. Do you really give Grooms a free rental? Sure do! 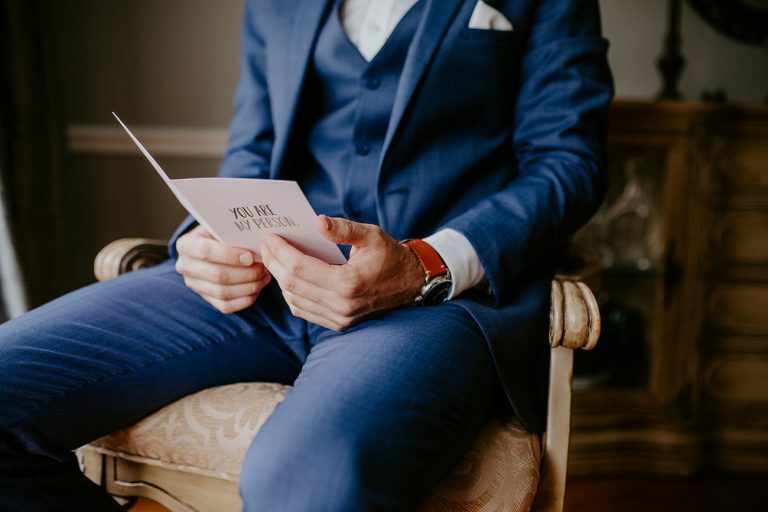 Whether it’s a groomsman, ring bearer, father of the bride or just an old friend; five paid rentals qualify for a free groom’s suit or tux rental. Celebrate your big day with a free rental, on us! Our quality and our service. Award winning and super awesome. We got to dress an entire wedding party who was not allowed to use the venue they wanted because they were gay. We like to do good. Picking the suits or tuxes up the day before the wedding is dangerous! And you don't have to! Use us. We will put the suit or tux on the doorstep of every person in the party 14 days before the wedding. We LOVE dogs. And we donate to the ASPCA to support our fur friends. We were founded by the former CEO of Men's Wearhouse, who is super fun and knows EVERYTHING wrong with rental. And we never turn down a chance to make a bride smile. 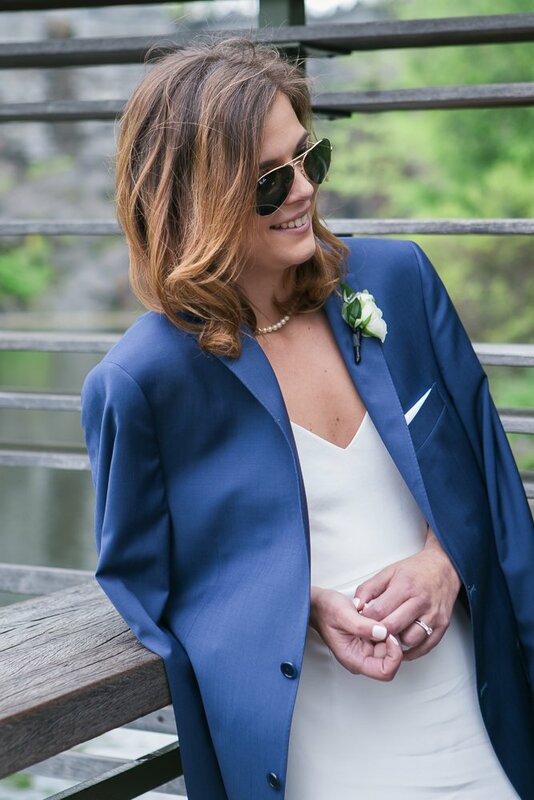 Looking for suit inspiration, check out the Generation Tux Gallery, featuring hundreds of real life Groomchillas! Brittany Finkle is a Chilla Graduate, friend of Bridechilla AND the founder of Happily Ever Borrowed, her bridal accessory rental service, that partners with high-end bridal designers to loan out veils, sashes, and combs. Always drawing and designing, she graduated from Cornell University with a degree in Fiber Science & Apparel Design. She was lucky enough to work in planning, merchandising, and buying for top luxury companies such as Ralph Lauren, Saks Fifth Avenue, Hermes and most recently Chanel. She launched Happily Ever Borrowed in 2012 to help women to rent their bridal accessories for their wedding day. She continues to juggle her life in the luxury fashion industry with helping brides find their dream accessories every day! She lives with her husband Ben and enjoys spending as much down time as possible in their dreamy Brooklyn apartment together. Brittany and Ben were married at The Inn At Erlowest on the shore of Lake George in Upstate New York. Brittany was a guest on an episode of Bridechilla prior to her own wedding. Brittany shared their proposal story, how she (like me) juggles a full time job and her side hustle AND wedding planning. We also talked about parental expectations. Brittany shares a hilarious story about her Mom's deep interest in her hair length for the wedding (and knowledge of updos) and also being a very efficient Bridechilla Brittany and having had lots of details already planned, how Brittany struggled to give her family and friends things to do to help out. I have 3 older sisters, and when I was helping them to plan their weddings I couldn't BELIEVE how expensive accessories were! After my sisters spent their entire budget on their gown and then realize they still needed to spend nearly $1000 to finish the look, they were crushed. I knew I had to do something, the idea was conceptualized and a few years later, I launched! My FAVORITE part of working in the industry is hearing from our brides who felt beautiful on their big day without breaking the bank. Whether it's for financial reasons or just wanting to create less waste with your wedding, we're so happy to make our brides be able to look the way they want on their wedding day. Literally any bride. We love changing minds! Even "platinum brides" who are spending a ton on their wedding find value in renting their accessories! It just makes sense not to own something you can only wear once! Our entire ethos is about keeping your chill. The mere idea of spending $1000 on a veil can make any bride turn red, so we're here to help brides keep calm and borrow on. Honestly there are no other companies out there who are renting just bridal accessories like ourselves. We're working directly with top designers and have exclusive agreements with them to only rent with us as they know we're loyal to keeping both our vendors and brides happy! We've been up and running for 7 years and have rented to over 1000 brides, so we've got this down pat! Brides and vendors alike can feel safe with our brand and our mission. Well my own wedding of course! My husband had written the most incredible vows, which still make me cry every time he reads them to me. (On our anniversary...I don't make him bust them out after dinner every night). What is one thing you wish more couples knew about wedding planning? I wish Bridechillas and Groomchillas knew it doesn't all have to match and make sense. Seriously. No one will remember nor care. All your guests care about is not being hungry and having a good time. Anything outside of that is just icing on the cake! My accessories from my own wedding are up on the site available to be rented! We're working on our OWN accessory line which will be launched soon! You can take a style quiz on our site which can help you figure out what your bridal style is! All of our accessories are categorized so you can easily shop by your style! Get Your Send Before You Spend Box! In this article, Annabelle (from Bridechilla Directory friend Evergreen Lane Productions) talks about the traditional pillar of the wedding planning experience: the registry. The place where your future mother in law insisted you must request china, luxurious bed sheets, and a KitchenAid mixer. While there is nothing wrong with these gift ideas, more and more of us are eschewing the collection of more things we need to store and or keep clean. Enter our hero, the experience-based gift. I’m a recent Bridechilla grad myself (and guest on The Bridechilla Podcast). My husband and I were married on a lovely beach in Belize and spent 13 months of our engagement and newlywed season traveling around the United States in an RV. We did not have room for a bunch of stuff, to say the least. The experience-based gift ideas in this article are all things we either included on our registry or wish we did. Flytographer session - This company has professional photographers all over the world that will come take photos of you and your partner as you explore the city. We really value having pictures together, and sometimes selfies don’t do the trick. Plus, we had a destination wedding and missed engagement photos, so we don’t have pictures together in our hometown of Denver. A mini photo session would be a fun date option, and you could knock out your Christmas cards at the same time! Sip and Craft night - almost every city around the world has a paint and sip place where you can drink a beer or glass of wine while creating a piece of art for your new married pad. Increasingly, there are options Upstairs Circus for couples who would prefer to create with a hammer and nails instead of a paintbrush. My husband and I had a date day at a paint-your-own pottery spot where we decorated a Christmas ornament together. For crafty couples, research a local option that inspires you and add a gift certificate to your registry. Couples massage - Need a little stress relief after all the excitement of wedding planning? You’re not alone. Registering for a couples massage or spa day is an experienced-based gift that’s great for your relationship AND your mental health. Admission to a sporting event, concert or amusement park - We put a cash fund for baseball tickets on our registry since it’s my husband’s favorite sport, but you could just as easily customize this based on the interests of you or your future spouse. Concert tickets or amusement park admission make for unique date night gifts, or could add some variety to your honeymoon activities, depending on your chosen destination! Gift certificate to a meal kit service - My husband and I received a gift certificate to Blue Apron, and we were able to get several weeks of new recipes to try. Typically, my husband does the cooking in our house (I know, I’m lucky!) but it was so fun to learn something new together. We poured a glass of wine, put on a playlist, and had a date night in. This is an excellent gift for both couples who are more experienced chefs who want to try some unusual ingredients and for those who are new to the whole cooking for themselves routine. Plus, there are many meal kit options to choose from based on your location and dietary restrictions. Collection of family recipes - If you’re in search of a bridal shower idea that won’t require you to add another 50 knick-knacks to your registry, consider gathering family recipes. Invite everyone to bring a favorite recipe and store the cards in a keepsake album or box. Having recipes from my husband’s grandmother back in the Philippines sitting right next to the one for Texas baked beans my aunt would make in the summertime is something I cherish and serves as a symbol of our blended family. A Passport Program - Many cities have initiatives to help residents get out and explore the culinary scene. The Passport Program is one of those, serving US cities like Denver, Washington D.C., Minneapolis and more. Essentially a fancy coupon book, the passport provides 2-for-1 specials on drinks at a wide variety of local restaurants and bars. This is the perfect gift for foodies who love exploring local haunts, and as a bonus, it’s a budget-friendly registry addition. City tour - one of the best gifts my husband and I received was a food and street art tour in the Wynwood neighborhood of Miami through Cloud9 Living on Zola (also, make sure when you sign up to Zola, you use this link and codeword BRIDECHILLA, for $50 credit). The walking tour meandered through the arts district, and we sampled from 5 different restaurants while learning about the artists and murals throughout. Adventuring with your partner and learning about the culture and history of a new place can be so much fun. Pick your local city to explore or choose an area that you’ll be traveling to for the honeymoon. Honeymoon Film - Are you heading on the trip of a lifetime after the wedding? Bring home a souvenir you don’t have to pack in your suitcase with a keepsake honeymoon film. One of my favorite things to do is take all our iPhone or GoPro video footage from our travels and edit them together into a vacation film my husband, and I can watch over and over again. Don’t worry if you’re not a professional video editor either - that’s precisely why I created my heirloom honeymoon film offerings. Find me on the Bridechilla Wedding Directory! Membership to a local museum - We’ve supported both the local botanic gardens and the art museum, but there are tons of options depending on your area of interest. Since my husband and I travel a lot, we chose the level of membership to the Denver Art Museum that included reciprocity with 70 other museums across the United States. We’ve visited at least 10 of these museums for free thanks to this gift! Museum membership is a great way to support the arts and/or sciences, your local museums, and get some travel perks too. National Parks Pass - More into the outdoors than museums? Add an annual parks pass to your registry. Whether you’re in Australia or the United States, the park service has various levels of park membership. You could pick a favorite park that’s close to home so you can explore it in depth, or choose a regional or national level pass if you plan on lots of adventuring as newlyweds (you’re my kind of people!). I hope this list inspires you to add experience-based gifts to your registry. Some of these ideas require a little extra research up front, but they pay dividends when you and your future spouse get to fill up your first year of marriage with incredible experiences that strengthen your relationship and create memories that you’ll be talking about for the rest of your lives. When my husband and I set up our registry, we were a little worried about ruffling the feathers of our more traditional guests. In the end, however, the experience-based gifts were some of the most popular items on our registry overall, and the KitchenAid mixer we thought we had to have is still there, un-purchased. No regrets! Annabelle creates Honeymoon Films from footage you take on your trip, using gear as simple as your phone if you want! 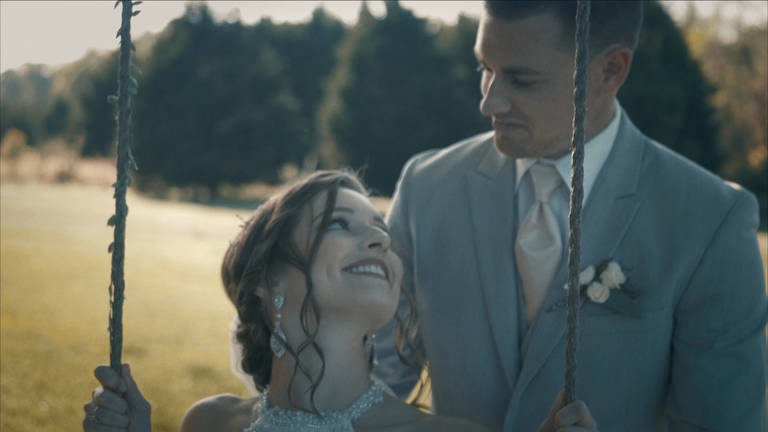 The process is simple, you take the videos, send them to Evergreen Lane Productions, and Annabelle edits your videos into a beautiful, heirloom honeymoon video. Her love of travel and filmmaking shine in this unique service! It was my own experience planning a destination wedding that made me realize that my travel films would be a perfect fit for honeymooning couples! For me, the wedding day is just the start of an amazing adventure + I love that the honeymoon is the first traveling you do as newlyweds. Travels with my own husband are some of my own most cherished memories, and I want to help others document those treasured memories as well. My favorite couples are the adventurers, the ones who are more excited about planning the epic honeymoon than the wedding day itself. The couples I have the most fun with are ones who have more experiences than kitchen appliances on their registries and who love collecting new passport stamps. You don't have to have a lot of creative experience or fancy gear; we go over exactly what you need and spoiler alert: you can use the camera or phone you already have. Planning + dreaming of your honeymoon is a nice break from wedding planning and a friendly reminder that life will go on after this One Big Day...in fact, it's kind of the best part! I don't know of any other videographers or editors who are doing honeymoon films, but every one of my clients has been SO thankful, even watching their vacation films years later with tears in their eyes because they're such beautiful memories. Plus, I keep things down to earth: no fancy gear to buy (unless it's your thing! ), no complicated tricks to learn (I have a printable pocket guide you can take with you), and no stress when you come home (all your footage gets sent to me so you can focus on recovering from jetlag). My husband and I got married on an island off the coast of Belize. The whole trip was amazing from start to finish, but my favorite memory was when my wedding planner rescued us from the airport after a flight delay. We'd missed the last water taxi to the island but she found us a private boat captain who was willing to take us (in the rain, in the dark) and 12 of our other wedding guests secretly to the island. Thankfully, the weather was perfect on our wedding day + everything else went so smooth! It's ok to have the wedding you want to have. And it's ok to ask for experiences on your registry or ask for money for your honeymoon. The stress of "making everyone happy" is not worth it! Share 3 fun facts about you and your business! 1. I currently live in an RV with my husband and our cat - we're traveling around the US! 2. I've visited all 7 continents - Antarctica was my last and we set foot there a week before my 30th birthday. 3. I got started in filmmaking because of an obsession with Lord of the Rings in high school - my friends and I even recreated our own version: acting, shooting, and editing the whole thing! We hope you have enjoyed getting to know more about Annabelle and her heirloom honeymoon video editing service, Evergreen Lane Productions. 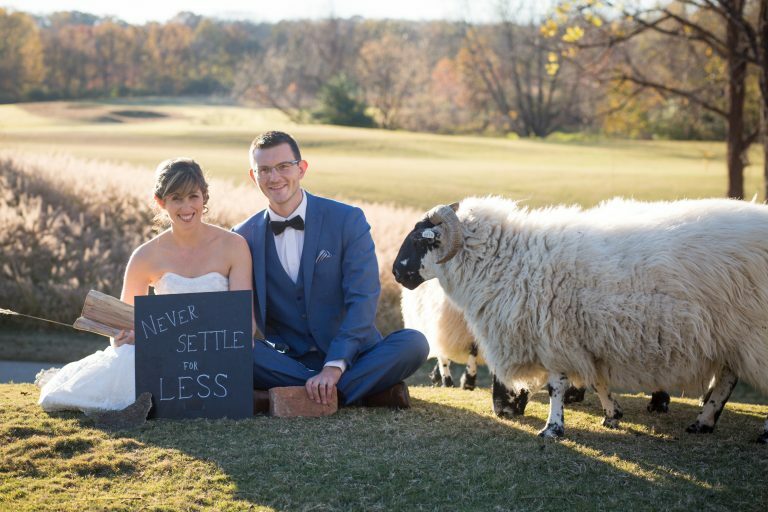 Visit their profile in the Bridechilla Wedding Directory or their website to learn more! Allison is the self-described "ginger, mermaid, unicorn, and graphic artist" at Wild Joy Studios, a custom heirloom stationery design studio. Allison's bespoke paper goods will not only impress your guests and set the tone for your wedding, but they will also be a keepsake for your to display, and cherish for years to come. Not sure you want something fully custom? Allison has you covered with her semi-custom collections of stationery designs! Learn more about Wild Joy Studios in this interview with Allison! I’ve been doing graphic design professionally for about 7 years now, and playing with graphic design for over a decade. I realized I loved wedding design in 2015, when one of my amazing friends asked me to help design their stationery set. I was hooked. I’m always honored when a couple lets me contribute to their wedding day. It is, very often, one of the happiest days one has, and it means so much for you to let me be a small part of that. I love what I do, I love paper, I love design, and I love weddings. I love adventurers, boho couples, and people obsessed with nature as much as I am. I have three collections: Celestial (space, stars, night skies,) Botanical (leaves, trees, blooms,) and Wanderer (hiking, travel, wanderlust inspired.) Really all three of them boil down to a love of the outdoors and nature. I try to make the process of taking care of all their wedding paper as easy and stress free as possible. I offer pretty, custom maps that can compliment your wedding suite, or that can be printed large to be kept as a reminder of your special day. I think that combined with my focus on nature themes makes for some lovely, unique stationery pieces. My entire wedding day was perfection! It's so hard to pick a specific memory from the day, even the parts I had worried about being stressful were lovely. I have a picture of my and my husband during our first dance being silly, with my mom in the background smiling at us, which is forever my favorite photo memory. I lost her a few years ago, and looking at that picture of her always cheers me up. What is one thing you wish more couples knew about wedding stationery? Paying a little more for keepsake worthy paper products is not a waste! People always use the "well people are just going to throw them out." They aren't for those people though, they are for you, and when you end up with paper that you adore, it becomes one of the few things from your wedding that you can keep forever, and pull out one day, and show to your family along with any other of your wedding heirlooms. My office buddy is a corgi named Carl Sagan, who in my humble opinion, is the cutest dang pup in this entire world. Go ahead, search #carlsaganthecorgi if you don't believe me. I'm obsessed with astronomy and space (hence the pup name, and the Celestial collection.) One of my favorite lines from the original Cosmos series was “The surface of the Earth is the shore of the cosmic ocean. On this shore, we've learned most of what we know. Recently, we've waded a little way out, maybe ankle-deep, and the water seems inviting. Some part of our being knows this is where we came from. We long to return, and we can, because the cosmos is also within us. We're made of star stuff. We are a way for the cosmos to know itself.” I don't have any tattoos, but one day I want to get one that somehow embodies this quote. I didn't find out about Bridechillas until a couple of years after my own wedding, but I like to think that I was somehow channeling my inner Chilla without even knowing it existed. I love the community and one of my favorite things is seeing all of you lovely Chillas on your wedding days. We hope you have enjoyed this interview with Allison of Wild Joy Studios. To learn more, check out her profile in the Bridechilla Wedding Directory and visit her website. Elyssa & John Kivus are the husband & wife team behind Kivus & Camera, wedding photographers in Durham, NC. Elyssa and John bring their enthusiastic, joyous, and fun-loving personalities to your wedding through their vivid and energetic wedding photography. Check out our interview with Elyssa & John to learn more about their business, and philosophy about wedding photography! Elyssa: My background is in journalism. I went to college wanting to be a photojournalist and interned at great papers, just waiting for my opportunity to land a staff position. But, this was 2009 and the only thing newspapers were doing was firing people. I ended up in law school (mock trial had also been a passion), but I still loved taking pictures on the side. A couple years into my law career (which I hated), a good friend was getting married with basically zero budget, and I offered to bring my camera. I fell completely in love with documenting weddings, started the business, and was able to take it full time about 2 years later. My favorite thing about working in the wedding industry is experiencing vicarious joy. I love getting to be around so many happy people and learning what makes them smile. The Kivus & Camera couple knows that weddings are meant to be enthusiastic and joyful. One of your top priorities is having a great time, whether you're inviting just a couple witnesses to a courthouse ceremony or maxing out the occupancy allowance at a ballroom. There will probably be good beer available after the ceremony, definitely some yummy dessert, and, more often than not, dancing (good and bad). You're probably super nerdy about at least one thing (comics, sports, biology, wine, whatever) and we can't wait to talk to you about that thing. How do you help your clients keep their chill? Sending them to Bridechilla! But mostly I just make myself available to provide advice, be a sounding board, a joke machine - whatever's needed in that moment. I've been to a lot of weddings. I planned my own wedding. I've got a lot of knowledge to share and I love to help. I also love to make people laugh, so I will always be striving to do that. Sometimes it feels like the wedding photography world is divided into two styles: "light and airy" and "dark and moody". We're not either of those. John & I have decided our style is "Vivid & Energetic." So from a photos perspective, our look is different than a lot of what you'll see. We embrace color, bring our own lights, aren't afraid of bright sun or dark rooms, etc. Aside from the photos perspective, I think our backgrounds set us apart. This is a second career for me (I was an attorney first, a divorce attorney no less), and John is still a practicing intellectual property litigator. It takes a certain set of skills (dedication, problem solving, self-loathing, craziness) to succeed in law school. I'm recovering from the self-loathing part, but I am bringing some serious passion for the business of weddings. My favorite wedding memories are always moments that really highlight who this couple is. When the groomsmen serenade the bride with Backstreet Boys and she joins right in, when the couple have customized their vows independently and both have the same pop culture reference, when "their song" comes on and it's Who Let The Dogs Out. What do you wish more people knew about wedding planning? I wish more couples knew that they can make their wedding whatever they want. There's no specific timeline you have to follow - have your "reception" from 4-10 with the ceremony somewhere in the middle. There's no reason you have to have bridesmaids or groomsmen. There's no reason you have to carry a bouquet or cut a cake. Just do you. From a photography perspective: Great photos take time. Those awesomely lit couple portraits are a lot harder to get when all we have is 3 minutes at the end of cocktail hour after all of the family photos are done. Kivus is our last name. It's pronounced Key-vuhs. You can remember this by calling us Kivus & Butthead (you decide which of us is which). We shoot on two different camera systems! I shoot with Nikon equipment, but John uses a Sony mirrorless system. Depending on what Nikon comes out with toward the end of this year, I may be shifting to Sony too though. We go to Disney World as often as possible - multiple times a year. I may even edit your wedding photos from one of the parks. I've been known to pull out my laptop at Animal Kingdom's Nomad Lounge. To learn more about Kivus & Camera and their photography, visit their profile in the Bridechilla Wedding Directory and check out their website! Sharma Shari, geek wedding photographer extraordinaire, is both a member of the Bridechilla Wedding Directory and one of our community admins! Sharma is based in Florida, but shoots weddings all over the southeast US & Puerto Rico, she loves to travel and is happy to go wherever you want to be married! Read on to get to know a little more about Sharma and see some of her delightful geeky wedding photography! I got into wedding photography kind of by accident. I wanted to try it but wasn't sure. Another photographer in my area invited me to assist her on one of her weddings... and just like that I was hooked. I love when the couple is having fun, I love to capture that their expressions! My ideal clients are couples that are not afraid to express themselves on their wedding day. They would add any nerdy/geeky element if that is what they love. And more importantly, they will plan their day as they want. Traditions or not. How do you help your couples "keep their chill" during the wedding planning process? I like to remind them that the most important thing is that they are getting married. Everything else we can fix or have delivered to the venue. They are marrying each other! What makes you unique and different from other wedding pros? I am very open. I love celebrating their uniqueness no matter what. I will be there for them during the day, not only taking photos but making sure they are having fun. If they are having fun, I can capture it! Seeing one of my couples throw the best "Hallowedding" ever. She wore a very fitting and beautiful black dress, they walked themselves down the aisle with the White Stripes song, and had the party of the lifetime at their favorite brewery! They did it their way...and even the mothers were jumping on the dance floor! What is one thing you wish more couples knew about wedding planning or wedding photography? Before contacting any vendor, sit down and talk about money. How much do you want to spend? Look around and research the reality of the type of wedding you want with the amount of money you want to spend. That will help with the price shock while asking for quotes. As far as Photography goes, I wish they would be true to themselves and acknowledge the importance of photography for them instead of just telling the potential photographer you are too expensive. In my case, I take care in planning my pricing, I know how much my work is worth. It is ok if photography is not your priority and you decided to have a low budget for it. But don't tell a vendor, any vendor, you are too expensive! I better way to approach this is by telling: Your work is amazing but you are out of my budget. Thanks! Also, always let the vendor know that you are going with another one. We really appreciate that you are taking the time to let us know! I am a geeky and nerdy person. If you are having a wedding full of fandom puns, more likely I would understand all of them. And will dress accordingly to your fandom. The more details about your wedding I know, the more excited I get. I love geeking out with the couples, especially when I see them excited about planning their day! Bonus - I am Puerto Rican, so I speak Spanish! If you want to learn more about Sharma and her photography, visit her profile in the Bridechilla Wedding Directory and check out her website!